Some near death experiences you can never shake. I spent a day riding Helicopters. Rushing from one to another. One had a warning light which forced us to make a hard landing. There wasn’t much I could do but hold on. I heard what I mistook for firecrackers. Then I heard a whistle next to my right ear and my knees knew just what to do. On my way down I told my senior officer to get down. (He hadn’t heard the bullet and thought nothing of the fire crackers) I would go through a minor stage of PTSD about a half an hour later. I’ve been in two major car accidents and one near miss. That thing about your life flashing before your eyes didn’t happen to me. When I was 18 I was living on Greenridge ave. in Oakland California. It’s just next to Keller ave which takes you up to “Skyline” blvd. My first skateboard was run over by my brother in law when I was 11. 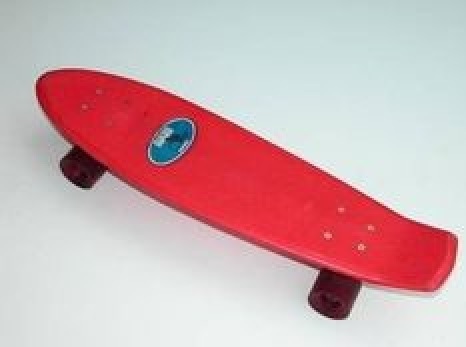 With one of my first paychecks, I stopped at Sears and bought a “Makaha” skateboard. It was pretty cool for the time. (1974?) It cost about $15.00 as opposed to the $200.00 boards you can buy today. It was cheap, making my near death experience all that much nearer. So in an effort to prove my skating abilities (and to see if I still could ride a board) I went about 1/3 of the way up Keller. It didn’t exactly look like Powell Street in San Francisco but looks are deceiving. I had two great things going for me. I had brand new trucks and wheels on this little 18” board and NO CARS turned onto the road I was on. But I had one very formidable foe ~ “Gravity“. At first it was amusing and quite fun. Then as I picked up speed, the fun turned to horror. My wheels started vibrating and making a dull roar. Before I knew it, I was flying down this mountain road. As with the first near fatal accident I was in, there was a moment when time slowed down. My mind realized that I was going so fast that if I tried to abort this act of stupidity, I was E.R. bound or worse, morgue bound. I was in too much danger to be scared. So as I was nearing the bottom, I could see flat ground. What was amazing was that the angle of descent, didn’t stop until I got to a flat surface. It went from about a 30 degree incline to nothing in about 10 feet. I thought I was out of the woods once I hit flat land. Then I realized that a busy cross street awaited me at the bottom. So almost without thinking, I made a left turn and slowed to a stop on a back street that paralleled the busy street. Exact words to self: “THAT WAS STUPID”. To this day I have never had to endure such constant fear combined with self-control. I refused to panic and I did not. I knew if I didn’t make it, there was not going to be a happy ending to this story. To this day I have visions of the Wild World of Sports downhill skier biting it as he approached the jump. That’s what would have happened to me only I would have hit a parked car or lost my skull to road rash.